The property offers excellent potential as a spacious detached family home. The roof was repaired and overhauled following the Millenium Storm and pvc double glazed windows were installed in about 2000. There is approximately 1.5 acres of land with the property (to be delimited) and a substantial detached stone barn and smaller one in the paddock. Viewing is recommended. 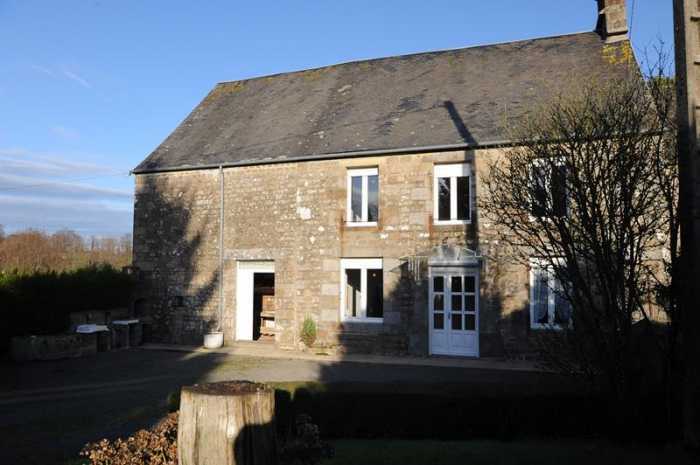 The property is situated 10 minutes drive to the market town of Sourdeval and 15 minutes drive to Vire. The Lac de la Dathée, ideal for walking, fishing and boating and with a safe, sandy beach and an 18 hole golf course are within 10 minutes drive as is the Saint Sever forest. It is situated in the southwest of Normandy, near the borders of Manche and Calvados. Extensive recreational facilities can be found nearby including local waterfalls and walking clubs, canoeing and outdoor sports. Major towns such as Caen, St Malo, St Lo, Falaise, Bayeux, Honfleur and Northern Brittany available for day trips. Normandy landing beaches are easily accessible. Suisse Normande and Spa towns 35 minutes drive. Choices of Golf Clubs with open availability for non members. Sports centre with pool and slides, Go Karting and board park less than 15 minutes. Local village with many bars restaurants and shops. Weekly market on a Tuesday in Sourdeval, including Livestock. 10 mins to Bowling, sports centers and 18 hole golf course and the forest of Saint Sever. Beaches within an hour, river activities/ forests/ spa resort within 50 minutes. The nearest Airport is at Caen (about 38 miles) with flights to London Stansted or Dinard (70 miles). The nearest Ferry Port is at Caen (50 miles) and the nearest train station is at Vire (8 miles) from where you can take a fast train to Paris. Entrance Hall 1.96 x 1.90m Glass Canopy and partly glazed door and side panel to front elevation. Utility Room 3.18 x 2.13m Window to rear elevation. Space and plumbing for washing machine. Bedroom 1 4.99 x 3.05m Window to east and front elevations. Fireplace (at present closed off). Wood flooring. Radiator. Bedroom 2 4.83 x 4.73m Window to east and 2 windows to front elevations. Radiator. Wood flooring. Fireplace (at present closed off). Telephone socket. Bedroom 3 3.96 x 2.86m Window to front elevation. Wood flooring. Radiator. Bathroom 2.58 x 2.40m Window to rear elevation. WC. Bath. Hand basin. Door to stairs to loft space. Attached Barn 7.09 x 5.49m Door to front elevation. On 2 levels on ground floor. First floor over. Door to rear elevation. Gravel drive to gravel parking and turning area. Enclosed garden to the front of the property. Rear garden laid to lawn with hedging and shrubs. BBQ. Well. Boiler Room 4.07 x 3.04m Oil storage tank and boiler. Window to rear and door to east elevations. Paddock with stone stable and corrugated iron shed. Separate Detached Barn with Fibro cement roof. (Part of roof missing). Mains water, telephone and electricity are connected. Drainage is to a septic tank. Oil fired central heating (boiler will need replacing). Broadband internet connection available. Please note : There is no Energy Rating for this property because the Vendors do not have the last 3 years' energy bills for full time occupation.